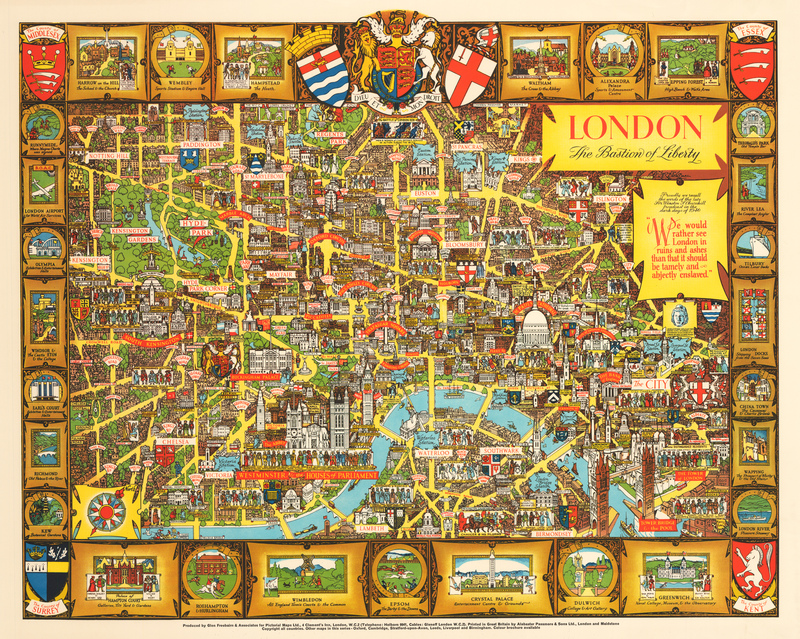 This remarkable, colorful and highly detailed pictorial map was published in the mid-twentieth century in commemoration of London following the horrific Blitz of WWII. In their own cartouche just below the title cartouche are the oft-quoted words of Churchill. ‘We would rather see London in ruins and ashes than that it should be tamely and abjectly enslaved.’ In this uncommon reduced version of the map Lee presents central London in all its marvelous detail. At once informative and decorative, he depicts the city iconographically with historical and cultural vignettes, numerous coats of arms, and a surrounding border of myriad vignettes of places of note both in and around the city. These vignettes picture places such as Hampton Court, Wimbledon, Greenwich, London Docks, to name only a few. The artist himself along with his dog and an artist’s easel appears just inside the border in the lower right quadrant. The map will bring great pleasure to anyone who loves the great city of London. Condition: This marvelous pictorial map is in A+ museum quality condition.